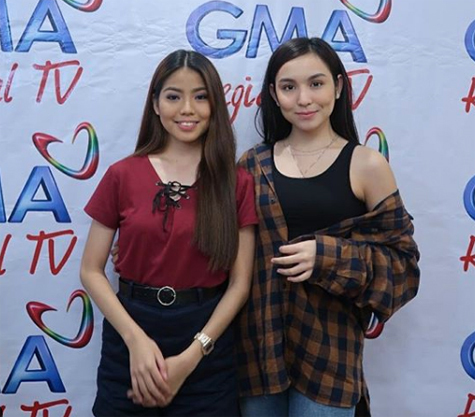 Kyline Alcantara understands that many are already pitting her against Therese Malvar since both of them topbill GMA’s latest drama offering titled, Inagaw na Bituin. “They say we are like the junior versions of Ms. Nora Aunor and Ms. Vilma Santos. It’s flattering but for the record, I’m not competing with her. Everyone knows that Therese is a critically-acclaimed actress and it’s quite challenging to share the frame with her in this show,” she avers. Both of them are award-winning junior actresses and although they haven’t shot any heavy scene yet, fans are already comparing their acting prowess. 'Inagaw na Bituin' lead cast members Therese Malvar and Kyline Alcantara in Iloilo to join in the celebration of the annual Dinagyang festival. Kyline has high respect for Therese’s talent. “Everyone knows her calibre. She has won lots of acting accolades and I admire her both as an artist and individual. It’s just the people who are pitting us with each other. For me, there’s no competition,” she reiterates. “I can see that she’s professional and so am I. We will do our best in this soap but not to the point of competing with each other. We will work together to make the show a success” she continues. The appealing lass has made a mark as a prime screen antagonist via the highly successful Kambal, Karibal. Due to her effective portrayal, she was tagged as “La Nueva Kontrabida.” How does she feel that in Inagaw na Bituin, she’s now one of the female leads? “Honestly, I’m nervous about it. I’m not sure what the viewers’ reception would be specially that ‘Kambal, Karibal’ was a ratings winner. It’s risky. I feel that it’s harder to be the main star rather than be the villain. I just hope the public will like the show when it airs,” ends Kyline. He’s been with GMA for 23 years already. Did he ever considered switching mother studios at one point in his career? The popular actor is grateful of the fact that he is one of few talents who can cross over to the rival outfit for projects just like his case with Star Cinema. The last show on his contract is the currently airing Cain at Abel but this early, talks are rife that he will top-bill the Pinoy adaptation of the hit Koreanovela “Descendants of the Sun.” Will he accept the offer if ever? Many of their fans wish that if that will be the case, his wife Marian Rivera will be his leading lady. “Well, I wish. I want to work with Yan again on a television project. But for now she cannot do it if ever because she’s on the family way,” states Dong.